An important component of Tended is the ability for you to look back from year to year and remember what you did in your garden, when, and how. This helps inform your future years of growing fruits, vegetables, and herbs by building on your successes, avoiding previous mistakes, and trying new experiments to see how they compare to previous growing methods. Plus, we hope it makes garden even more enjoyable by being able to recall the details of past years. Tended already allows you to track many of these things in a data-rich way with its areas, plantings, actions, harvests, and tasks; as we continue to build on Tended's reporting abilities, you'll benefit from how the rich, structured data can provide insights. For this reason, we're happy to introduce a Journal component to Tended. Now when you access your account, in addition to the Map and Calendar, you'll see another tab, Journal. Add a new entry and write as little or as much as you like to capture what's new in your garden. You can use plain text or use the toolbar above the text box to do some basic styling like bold, italics, creating lists, and to link to other sites if you like. You're also able to upload photos to your Journal entry after you've saved it. As you begin to use it, feel free to share the URL with friends and family who are interested in gardening; you can treat your Journal as a gardening blog that's already set up for you! 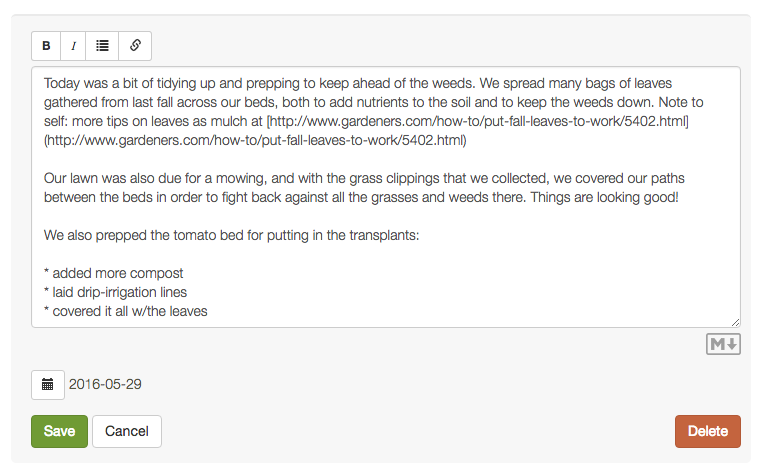 Tended's Journal utilizes a formatting termed Markdown, which makes the stylings possible. You don't need to know much about Markdown if you're not interested (though if you are, take a look at http://www.markdowntutorial.com/), but just know that when you use the toolbar to make a word bold, for example, your content will change to include asterisks around the word; that's how Markdown signals that the word should be bolded upon saving. Once you save your entry, things will appear without the extra characters surrounding the content and be formatted as you hoped. We're excited to read about your garden's goings-on in your Journal!